Hew Craufurd was the 6th child of Patrick Craufurd of Auchinames (Renfrewshire) and Jean Craufurd of Crosbie (Ayrshire). He graduated from University of Glasgow (M.A.) in 1648 and five years later was ordained at the first minister of the parish of New Cumnock. He married Euphemia Cunningham the widow of William Cunninghame, minister of West Kilbride (who died in 1669) and together they had two sons* – Hugh and John and two daughters. They lived at Nether Garrieve (now known as Mansfield). These were turbulent times for the kirk of Scotland. His new church at New Cumnock was completed in 1659, the year after the death of Oliver Cromwell and the year before the restoration of Charles II. The Stuart monarch was soon interfering in church affairs and in 1662 the Reverend Craufurd and the Reverend John Cunynghame of Old Cumnock, like several hundred other ministers, were ‘outed’ from their kirks for refusing to conform to Episcopacy. Although the original parish of Cumnock had been divided into the two new distinct parishes of Old Cumnock and New Cumnock in 1650 the Earl of Dumfries was successful in having this division annulled in 1667 and two years later Samuel Nimmo was installed as the ‘conforming’ curate of the parish of Cumnock. In 1672 Hew Crawfurd accepted what was known as the 2nd Indulgence where outed ministers were allowed to return to the church under certain conditions and were paired with another minister. At the parish of Riccarton Hew paired with the Reverend Hugh Campbell (the grandson of Charles Campbell of Horsecleugh, Cumnock) who had previously been outed from the parish. However both ministers actions continued to cause concern and in 1674 Campbell was accused of ‘baptizing irregularly’ while in 1677 Crawfurd was cited to appear before the Privy Council. Outed ministers had began to preach at illegal open-air meetings, known as ‘conventicles’, in the surrounding fields and valleys. Such meetings were soon outlawed and in 1683 Hew Craufurd was banished to Ireland for his refusal to stop attending conventicles. He was minister at Glenarm, County Antrim. At the Glorious Revolution Hew Craufurd returned to New Cumnock in 1688 and served as minister until his death four years later. His sons Hew and John continued to live at Nether Garrieve in the parish. It is not known if the Rev. 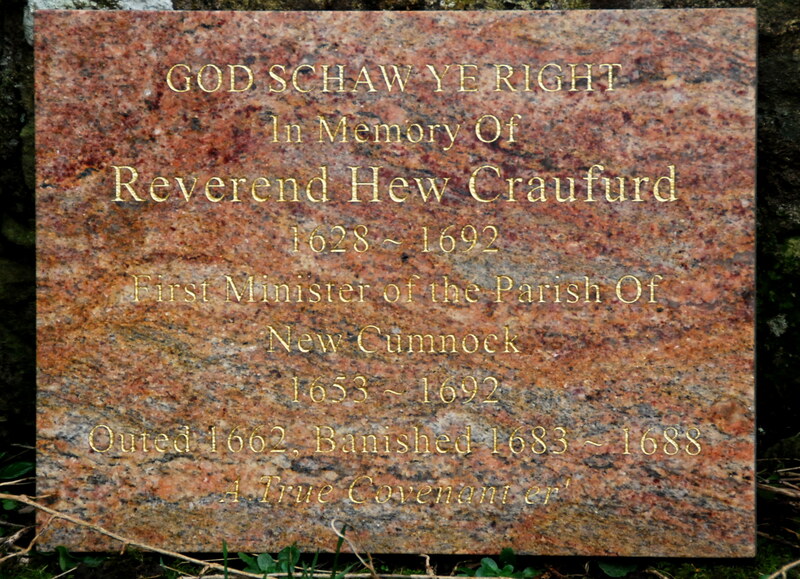 Hew Craufurd lies buried in the Auld Kirkyard. This Memorial Plaque was kindly gifted through the very generous offering raised at the New Cumnock Parish Church ‘Songs of Praise’ gathering of church congregations from across Ayrshire. HUGH CRAUFURD, fourth son of Patrick C. of Auchenames and Jane Craufurd of Crosbie ; educated at Univ. of Glasgow; M.A. (1648); adm.before 1653 ; deprived by Act of Parliament llth June, and Decreet of Privy Council 1st Oct. 1662. He had sasine of the lands of Garrive July 1669. He became indulged min. at Riccarton in 1672, and afterwardsheld a charge in Ireland ; returned here at the Toleration; died May 1692, aged about 64. He marr. Eupham, daugh. of John Cunningham of Baidland, and widow of William Cunningham, min. of West Kilbride, and had issue Hugh of Garrive ; John, apothecary, Paisley. HUGH CRAUFURD, MA., formerly of New Cumnock ; had an indulgence jointly with preceding (Hugh Campbell – see below)by Privy Council 3rd Sept. 1672; was cited to appear before Privy Council llth Aug. 1677, and his cautioners also 31st Aug. 1681. He returned to New Cumnock in 1688. HUGH CRAUFURD, MA., formerly min. of New Cumnock ; min. at Glenarm 1685 to 1688; returned to Scotland 1688 and re-adm. at New Cumnock at New Cumnock; died 1692.